Stores reference 22c/1535. Size 9. Classic early 1950s 'escape' boot based on the earlier 1943 pattern. 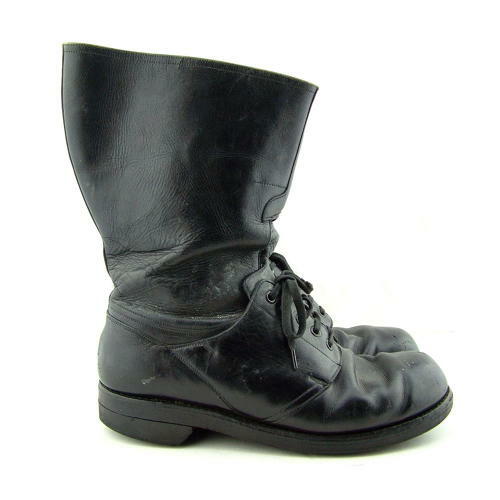 It has a fairly standard shoe at the bottom with an unlined polished leather upper section that could be removed if evading in enemy territory. Unfortunately, due to the generous proportions of the uppers on these boots there was a tendancy for them to fall off during high speed ejections! With the slightly later rubber pattern sole. Labelled with stores reference and size marks. In service throughout the 1950s and until the mid 1960s. Stock code B22472.